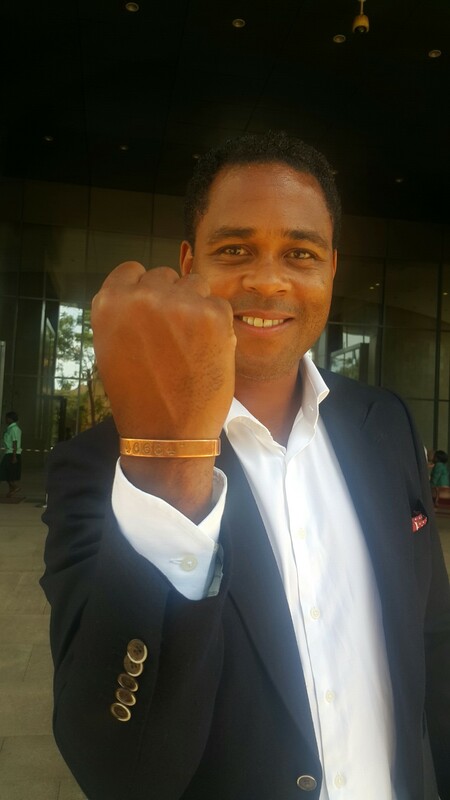 This week the soccer legend Patrick Kluivert visited Uganda for the first time in his life as a crucial step in the set up of a promotional tour that will open Uganda up to tens of millions of potential tourists and investors in coming years. The story behind the story, though, is a tale of good Ugandans versus bad Ugandans and how one group triumphed over the other for God and Country. It all started with a good Ugandan, a young chap reportedly called Joseph Baguma who applied to join a soccer academy in Spain run by Rayco Garcia Cabrera, a soccer talent scout, and passed the trials easily. Baguma was the first Ugandan ever to join the academy, and played so well that he got even more of Rayco’s attention – so much so that the soccer scout told his mother about the young man, and the old woman got Baguma to move out of his hotel and into her home. And Baguma talked about Uganda a lot, even though he was based in England; before long Rayco was convinced that he could find more talent of this nature if he came over here himself. After consulting his colleagues – the Patrick Kluiverts, Johann Cruyff’s and Lionel Messi’s – Rayco Garcia took a contact from Baguma and flew to Entebbe. Within hours he was blown away by the beauty of the place, the hospitality of the people, and the promise of tourism – much the same way Kluivert was when he arrived this week – the story of every visitor to Uganda. He kept spotting talent whenever he saw children dancing, playing soccer, running about – see, the things scouts look out for are not just accomplished soccer players already assigned teams. To his eyes, most of the bare feet he saw kicking balls in Uganda were golden boots gleaming in the sun! But the contact he had been given was a bad Ugandan. For two weeks, Rayco was shuttled from fruitless meeting to fruitless meeting, achieving nothing close to progress in the way of securing interest in opening up a talent academy in Uganda, or hosting the Barcelona Legends to a promotional game here. Instead, he got asked for money to set up high level meetings, and even the small things seemed odd to him – like the way his contact always had a meal in front of him when they met, but was never around to deal with the bill. He couldn’t understand why the Ugandans were not seeing what he saw. When Uhuru Kenyatta happened upon him at a hotel in Kampala a couple of weeks ago, within minutes the Kenyan President had stopped everyone and whispered urgent words of invitation for Rayco to drop everything and go to Kenya. Because of the talent he kept seeing, he stayed on a few days more, in spite of the phone calls from back home asking him to head back to business. On his last night, he had drafted a letter of frustration to share with his management team back home, when another contact, Basketball’s Ambrose Tashobya, suggested that he meet with Tourism’s Amos Wekesa. Those two good Ugandans turned the tide round. Amos (please note that I am on first-name basis with him) cancelled Rayco’s flight out and insisted that the man stays another week to see some of the tourism attractions, and accomplish what brought him. …and the next day they were shuttling between meetings with more good Ugandans – including the Prime Minister and President who within hours had confirmed government support of their promotional tour during which they would visit the national parks, nature reserves, and lots more. worth US$3.2 billion, and the world’s fourth richest football club in terms of revenue, with an annual turnover of €484.6 million. Well, this week I met both soccer stars; and one of my favourite conversations involved a sincere and earnest apology from Rayco Garcia Cabrera for #SpainIsNotUganda – it certainly isn’t, but we can be friends on some level for God and Country. In 1993 the movie “Cool Runnings” tickled our sides and our imaginations, those of us in settings similar to the Jamaicans in that movie. The plot had a village of rural Jamaicans (aren’t they all?) sending a team of bobsledders to take part in the Winter Olympics. It was unbelievable but gave us hope that ordinary, unlikely people were capable of doing anything if they had the determination and focus for it. The Jamaicans didn’t even have snow or ice cold conditions to help them train, but they persevered enough to dispatch a team to the Winter Games. Watching the movie, we focused less on the cold, wintry location of the games (I can’t even recall what country hosted the event) but saw a lot of Jamaica’s sunny climes, warm, clean sandy beaches, fun and lively atmosphere and those musically charged, highly entertaining people. Whereas the film itself earned its backers more than US$150million (back then), it earned Jamaica even ten times that in tourism dollars because of what we saw about the country and the Jamaicans. These thoughts were running cooly through my mind as I watched the Jamaican netball team extinguish our hopes of the She Cranes bringing home the Netball World Cup this year. Those thoughts made me realise that even if those heroines haven’t brought back that trophy, they have given us a massive opportunity we shouldn’t let go begging the way we let them go begging in order to honour us with their sweat, talent and positive energy. We should make a movie about the She Cranes. This movie would tell the world an inspirational story about the triumph of hard work and perseverance – by this small group of young, energetic, patriotic, hope-filled ladies and their backers fighting all odds to get to Australia for the World Cup. The movie would portray the girls in their home setting as they go around training for the games with a backdrop of fantastic scenery that will involve waterfalls, national parks, bird sanctuaries, and beautiful forests. In between training sessions the movies will depict the girls following an organic diet of fresh food from bountiful gardens full of well-arranged crops, and prepared by jolly chefs whipping up different types of Rolex and buxom cooks using things like endaggala to make delicacies like oluwombo. The banter within the movie, meanwhile, will be full of the positive vibes that most Ugandans represent in their day to day lives – the humour, the hope, the resilience that the She Cranes themselves showed throughout their journey to the World Cup. And all throughout, the movie script writer will ensure that the icons that represent Uganda are made visible all through so that wherever they are seen thereafter they sell the country to tourists and investors. On that note, actually, stop for a minute and clap your hands for that Ugandan chap who was wearing the Uganda Cranes t-shirt during the Uganda-Jamaica nailbiter and got featured widely all across Africa (and the world) on TV. THAT is how to advertise a brand! Every ten minutes of the She Cranes movie should, for instance, have a shot of the Uganda Cranes and She Cranes t-shirts – which will make our icons even more recognisable and loved wherever we go. And like the She Cranes, the people wearing those t-shirts will always be engaged in activities that depict hard work – not hanging around in bars ‘living it up’. Like the She Cranes, all the Ugandans in that movie will be shown heroically solving problems using the meagre resources available to them. 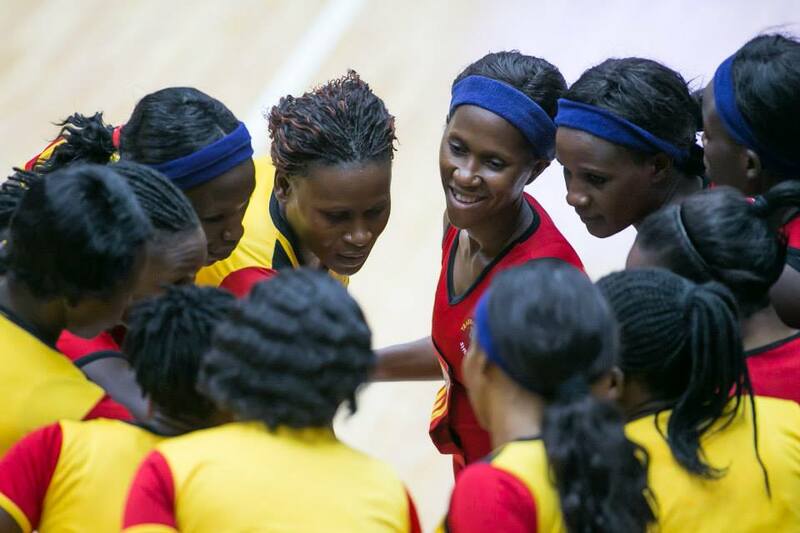 Like the She Cranes, all the Ugandans in that movie will show great amounts of strength and resilience, such that our children – boys and girls alike – will all take up netball as their sport of choice! That movie, ladies and gentlemen, can change very many things for Uganda here and abroad. The script writers can do such a good job at it that we could get the top 100 tax payers in Uganda to donate netball pitches and equipment to schools in every district, and build a stronger supply of players for the She Cranes. If individuals like Pamela Ankunda (she of National ID fame) could do so much leg work raising interest and funds for this team to go to the World Cup, imagine what the rest of us – individuals, families and companies alike – can achieve? But we won’t get that message through articles like these or from a barrage of SMS messages – even though that certainly does help; in fact, you must go and read this blog post by Joseph Owino making even more hefty suggestions. Let’s get a good team of movie makers to make a movie that will draw everybody into Uganda, rallying around the superb work of the She Cranes. I even have a title suggestion already: ‘For God and My Country’! I have fond memories of a time, back in the 1980s, when we children would spend weeks at my grandfather’s residence in Bulindi, Hoima doing all sorts of work – especially mowing the compound using a mechanical mower, then sweeping up the grass. To convey the cut grass into the nearby garden for use as mulch, we used an old iron sheet that had two holes punched into it for a long wire to be inserted and used as a handle. In those days of scarcity we made do with what we had, and invention was born of necessity. At around the same time in my life, one day in school we were taught about simple and compound machines, including the wheelbarrow. We learnt to draw the wheelbarrow and found it was made up of basically the two items in its name – a wheel and a barrow. Its function was to allow one to convey things carried in a barrow, using the convenience of a wheel. All this came back to me last week at the end of a day spent hobby gardening in Wakiso, with a couple of chaps, one of whom had a ‘Citizen’s’ identity card (not the National ID ones) that described him as a “Peasant”. I had insisted, as part of the gardening plan, that we divide the different agricultural plots with paths and walkways for various reasons – including enabling the workers to use wheelbarrows to do their basic duties. They were convinced, and at the end of the day one of the items on the list of requirements was a wheelbarrow – which they assumed would go for about Ushs90,000 each in Kampala. I eventually found one at Ushs50,000 being sold online, but of course it was imported from China. 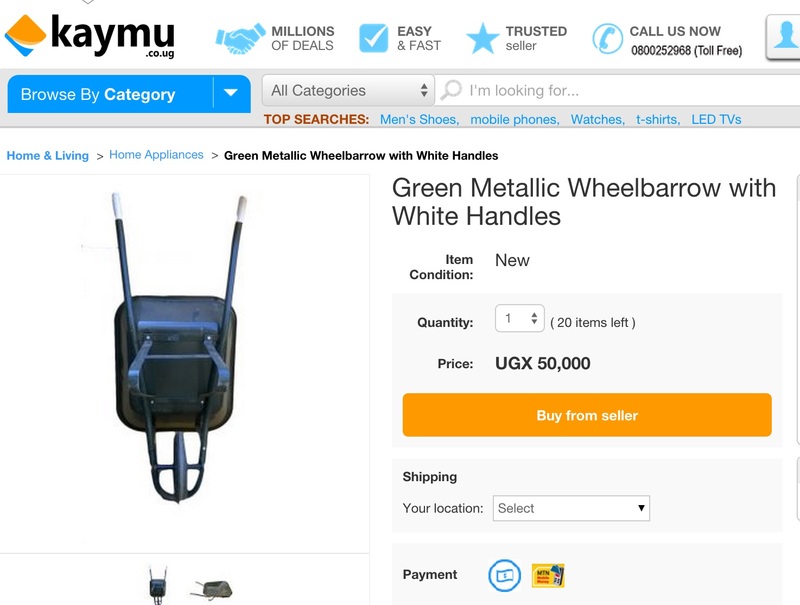 Dissatisfied with the idea that we still don’t make wheelbarrows here, I went off to the internet as usual, and found leads on alibaba.com for wheelbarrows going for as low as US$10 a piece – but only if you place a minimum order for 200 pieces. Then I called up my preferred metal worker who offered to make one for me at Ushs180,000. But before closing that discussion, a memory hit me from a month ago: while doing some work at home, we dug up quite a lot of soil that needed to be relocated elsewhere, but the wheelbarrow I bought years ago while doing the construction had since been stolen. Just as I was about to approve the hiring of fifteen casual labourers to use their muscle power, one of the workers told us we could hire a wheelbarrow from Mbuya, and provided a phone number. About Ushs1,200 of my phone airtime later, they had confirmed that hiring the wheelbarrow for the day would be Ushs3,000. But we also had to use a boda boda to fetch it, at Ushs5,000 one way. By the evening, I had spent Ushs14,200 for the use of a wheelbarrow for a day. And now, with my situation in Wakiso, I feel we need to make more wheelbarrows in Uganda – and not the wooden ones used to carry fruit. All the construction and farming work we are doing should certainly support a local wheelbarrow industry even if we do not produce the steel for it. But before that, would you believe this story from a Canadian on Facebook in 2011? After visiting Uganda and doing some voluntary work building things, he noticed work was being done too manually. 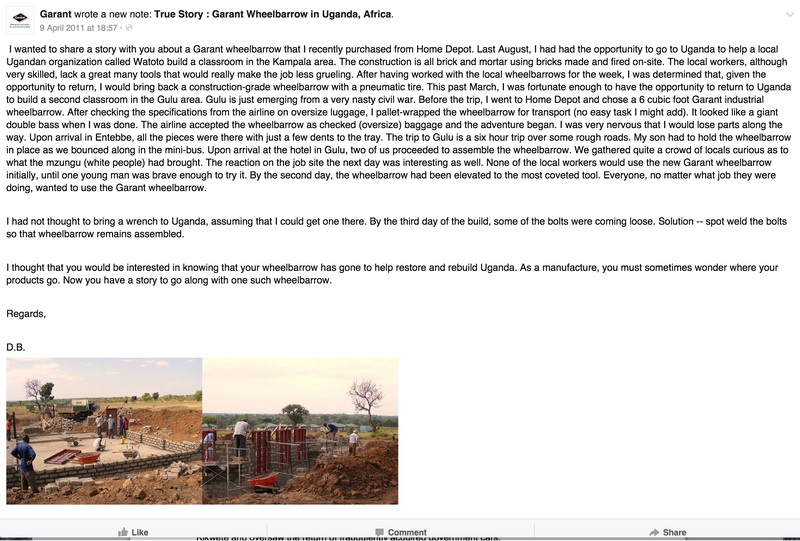 So this person bought a wheelbarrow all the way from Canada, flew it to Uganda on an aeroplane, then put it in a minibus to Gulu for use on a construction project, and the people there were fascinated by the contraption. In fact, after he had assembled it, with the entire village gathered round, they were all afraid to use it “until one young man was brave enough to try it”. To declare a young man in Gulu, the centre of war in northern Uganda for over two decades, “brave” for using a wheelbarrow, is what we call in local vernacular, “okujooga”. I blame our being kujooga’d for so long by so many people on our stupidity in not adopting simple technology for developmental use, in spite of our education and the availability of the basics we need to fashion our own wheelbarrows and make use of them to ease work. LIKE the rest of you I have heard and even experienced the neatness and orderliness of Kigali before, which is why I unreservedly support the people at Kampala Capital City Authority in all they do, and hope all our local governments follow suit. But of course not every corner of Rwanda is as neat and orderly as Kigali, just as not every bit of the United States is as slummy as some parts of Washington DC (yes – they have slums there too). Nevertheless, last week I was surprised by evidence of that famed orderliness even in the extreme corner of the country. I found occasion to hop into a taxi running from Cyanika to Musanze and even as I approached the jalopy I was put out by its appearance, the crazy-eyed hand-on-the-horn driver and his filthy tout shouting at us. Still, I boarded it because my options were limited at that point, and just as it set off I was firmly but politely instructed by the driver, the conductor sitting behind me, and the tout standing outside of the vehicle, to fasten my seat belt. They didn’t do it the way air hostesses do, but because they could tell I was a stranger they accompanied their words with gestures and finger pointing. 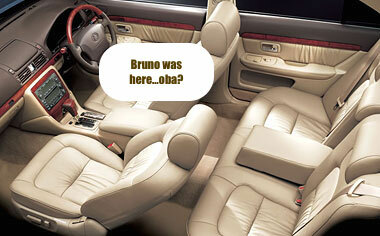 My neighbour, a Congolese fellow (he said, “Mimi mni mu-Congo-man”) even reached across and tugged at the seat belt. The taxi hurtled into the road as we jointly struggled with the worn, highly ineffective seatbelt, which eventually relented and went into its clasp but thereafter presented absolutely none of the tension that provides its safety component. They obviously knew it was useless, but were all steadfast in ensuring I wore it – which I found odd. We bumped and rumbled down the road at an unhealthy speed as I generally affirmed to myself that I was in the usual rural, upcountry setting on my beloved continent, going by the sights outside, and wondered why we didn’t generally go further faster, in development. 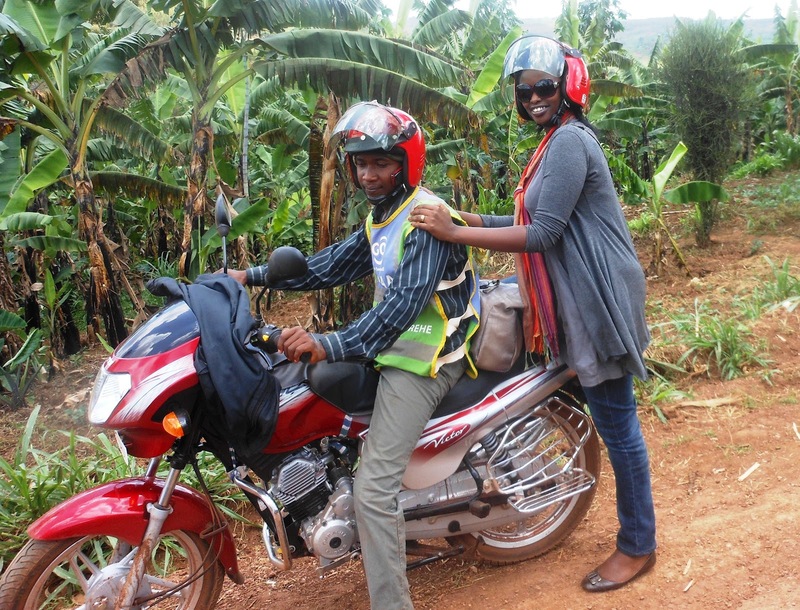 Then, after a few kilometres, I noticed an unusual element before me – and it wasn’t the vegetation, the buildings, the roads, or the clothing of the people we whizzed past – it was the boda bodas. I had to concentrate a little before I understood why they looked different – and it was their helmets. Over here, I am quite accustomed to seeing boda boda riders with helmets loosely perched on their handlebars as they whizz past cars to the left or to the right, nudging life expectancy limits. Over there, however, not only did they have the helmets on their heads, EVERY boda boda had TWO helmets on it – one on the rider’s head and the other on the head of the passenger or lodged on the handlebars. All the way from Cyanika and through Kigali, the helmets appeared in doubles. Strangely inconsistent, yet somehow fitting with the way we do things on this, my beloved continent.